Microsoft Scripting Guy, Ed Wilson, is here. All of the sessions for Windows PowerShell Saturday in Charlotte are pretty much set. The big question is whether we will have a really cool special guest, or a really, really cool special guest. Of course, you will never know the outcome. The tickets for the event have been going pretty quickly also. All of the previous Windows PowerShell Saturday events have sold out, and this one will be no exception. Last year, all the tickets sold out a couple of weeks before the event. This one may sell out even sooner. If you anticipate attending, sign in and get your ticket now. It is a pretty big deal. Last year, we had people from more than a dozen different states. It was a great time to get together, and talk about our favorite scripting language. Now I am pretty much done. I can add this command to a script, and my job as a scripter is complete. 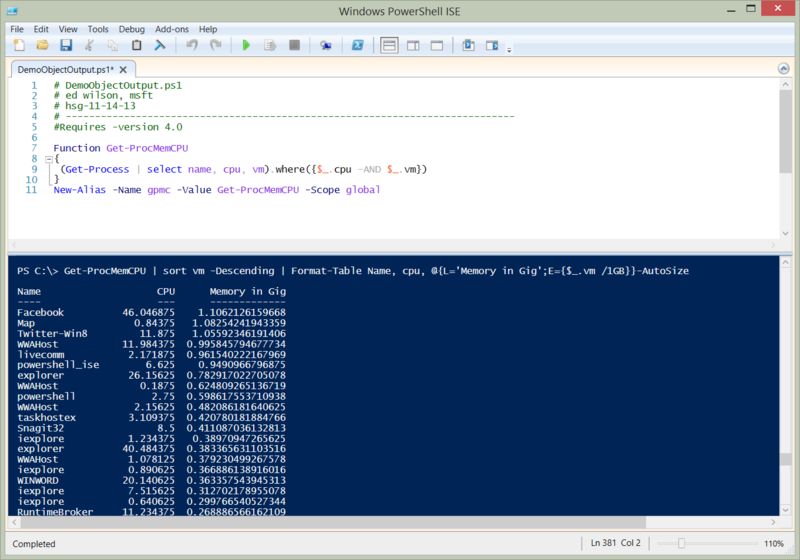 I have created a Windows PowerShell command that returns all processes that return CPU and virtual memory consumption information. The formatting of that output is now left as an exercise to the person who needs to use the information. For example, do they want a list or a table? 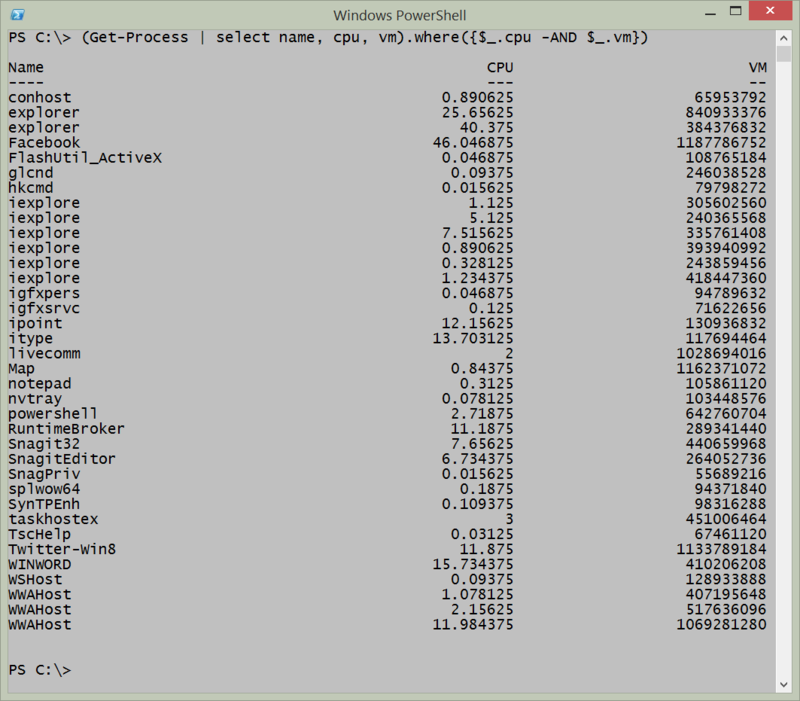 Do they want to sort by memory or by CPU utilization? 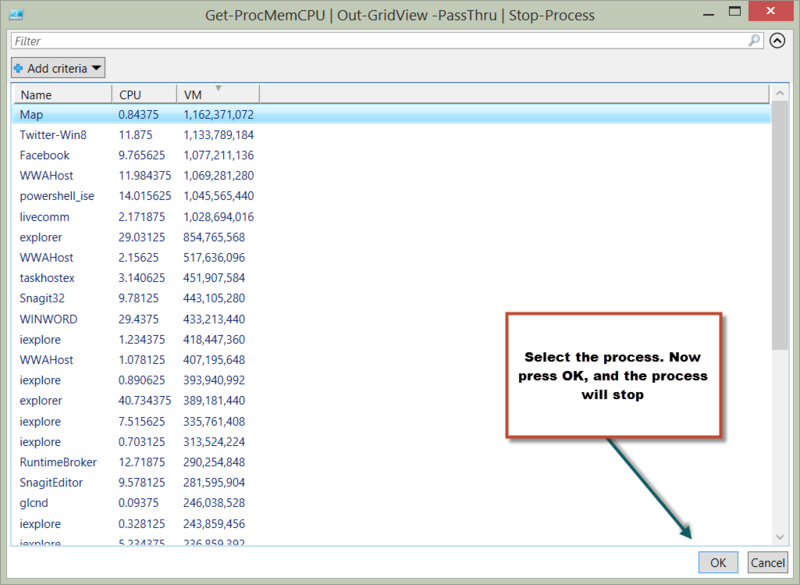 So by returning an object from my script, I permit a nearly infinite choice of additional actions—everything from formatting the output a special way to using the command as a basis of a GUI tool that permits me to kill the process with the greatest memory utilization. That is all there is to using Windows PowerShell objects. Join me tomorrow when guest blogger, Marc Adam Carter, will share his reprised use of Windows PowerShell to find an installed software blog post. It will be really cool, and he has made some great improvements.